End WIRCam mounts on the "old" CFHT prime focus upper end (PFUE), previously used with the CFH12K and UH8K cameras (and in much earlier days with photographic plates). The old optical corrector has been removed (now precluding use of CFH12K as a backup for MegaPrime), and CFHT staff has thoroughly renovated the mechanical and electrical environment of the upper end. In addition to its basic structure, the PFUE provides a temperature controlled environment for WIRCam and its readout electronics, and brings the instrument into focus. Unit The Image Stabilizing Unit (ISU) has been designed and built at Observatoire de Paris. It is used to produce small corrections of the image position on the focal plane of WIRCam: a glass plate in the optical beam in front of the camera can be tilted, to produce a displacement of the image proportional to the small angle of the tilt. The guiding signal is obtained from the scientific detectors themselves, on which a small guiding window can be read out at a high rate. The guiding window can be positioned anywhere within the detector. Detectors The detectors at the heart of WIRCam are HAWAII-2RG detectors, produced by Rockwell Scientific. Optics The optics which focuses the infrared light on the WIRCam detectors was designed and assembled by the Groupe d'Astronomie of Université de Montréal and the Institut National d'Optique. in the city of Québec. It consists in 8 lenses plus the cryostat window. 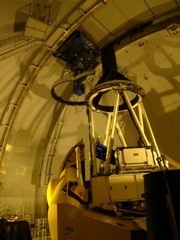 To minimize its own emission the optics is housed inside the WIRCam cryostat. It is therefore subject to significant thermal contraction, and its large physical size made this an interesting mounting challenge. Mechanics The mechanical structure of WIRCam and its cryogenic systems were designed by the Laboratoire d'Astrophysique de Grenoble. The structure was optimised to have extremely low flexures, and the large filter wheels to have reliable fast movements in the cold (15s maximum time for filter changes).